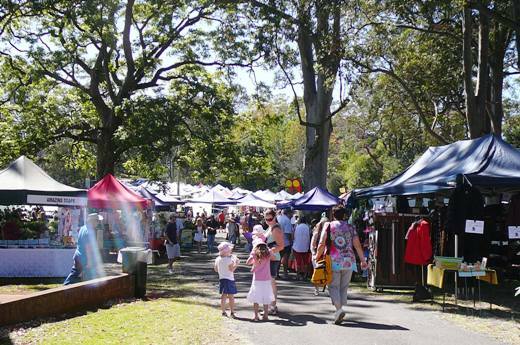 Once a month a market is held on Mount Tamborine. It has been some years since last I went. The idea is to get there early, even more so now as the market has grown and was crowded before nine a.m. So many stalls are there now under the big shade trees and so many people embracing the day and the atmosphere of vibrant colour and delicious smells all wrapped in a glorious, summer morning . The rise and popularity of markets, of buying fresh, organic produce, local grown and mostly local made seems to be growing in favour . There is no comparison to the strident, branded, environment of the big shopping malls. The market lives and breathes, interacts and inspires. Give me a market or small local shopping strip any day. However, I do have a peeve, that one of the compound for small animal petting. The poor little creatures are so stressed. Now that it is racing into summer in Australia it seems cruel to have the babies in the heat all day. Baby animals like human babies need to sleep a lot, not to be constantly poked and pinched, exposed to constant,strident noise, and at times roughly handled and chased. I wonder how we would like to be put in a pen or cardboard box ( or have our children in one) to be on public display, to be overfed, mishandled, frightened, stressed to the max and overstimulated. Just saying this is not a good thing and distressed me a lot. Kind of took the edge off the experience, so instead of leaving with the initial feel good vibe it made me all too aware of the cruelty we humans impose on all living things. I agree with you re the animal petting situation. Its very sad. I’m sorry to hear about the baby animals–perhaps you could talk to the person in charge? I, too, love local markets and feel so blessed that we have a weekly market just five minutes away. Just produce and other kinds of food, including two organic vendors. I’m glad they’re gaining in popularity in Australia, too. Absolutely right about baby animals- totally cruel !